Selecting the diamond that will be the focal point of your ideal engagement ring should be an exciting and fun experience. The diamond you choose will be the centerpiece to a ring that’ll last a lifetime, and it is a decision that should be made after a lot of consideration. Understanding each quality and element that goes into creating your diamond will not only maximize your budget but also alleviate any unnecessary stress you may be experiencing. 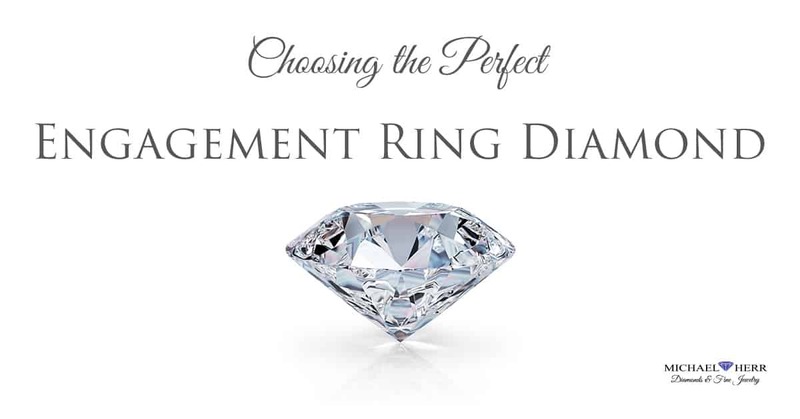 By educating yourself on how to choose a diamond, you are helping to ensure that you are making the right decision. The 4C’s refers to the characteristics of the diamonds that are most important when making a diamond purchase. The GIA created the 4C’s to be used as the universal system of grading diamonds. Here is a breakdown of what each characteristic stands for. Cut refers to the symmetry, proportion, polish, and brilliance of a stone. Often mistaken for merely its shape, but the cut and shape are actually very different. The cut has the highest impact on how your diamond will appear and the overall cost. It also helps to determine the overall quality of the diamond. The cut grade influences how well the stone will reflect light, meaning the higher, the more shine and sparkle your diamond can produce. When discussing a diamonds color, the lack of color is considered to be the highest quality. The lower the quality diamonds will have a noticeable pale-yellow tint to them. The color of a diamond is labeled by D, E, and F as colorless. While G, H, I, and J are considered close to colorless. The farther down the alphabet you go, the closer to color a diamond becomes, giving Z a noticeable yellow tint. Another characteristic is the weight of the diamond in metric carats. The higher the carat, the heavier a diamond will be. People mainly associate the carat with how large the diamond will be. When deciding on carat size keep in mind the ring wearer’s ring size. A diamond above 1.5ct may look unproportionate on a size 6 ring. While a size 7 ring might make anything below 1.5ct look smaller than it actually is. However, always keep in mind the ring wearer’s personal style as well. Compared to the other C’s, the diamond clarity is most likely the least important of the components. It grades the absence of any inclusions or blemishes. A good cut could help to cover any blemishes that may appear. Some buyers even consider inclusions to be a diamond’s fingerprint, in that it makes yours unique to all other stones. Picking out the diamond that will complete your engagement ring is a big decision. This doesn’t mean it has to be a stressful decision. At Michael Herr our professional staff will help walk you through the decision-making process of purchasing a diamond. It is our goal to help you make the most educated decision possible to ensure you love the engagement ring for a lifetime! If you are looking for additional resources on choosing an engagement ring we invite you to read our blog or to give us a call to set up your free engagement ring consultation.